Partner AliveCor also got a mysterious new FDA clearance. This article has been updated with a new photo and additional information from Omron. 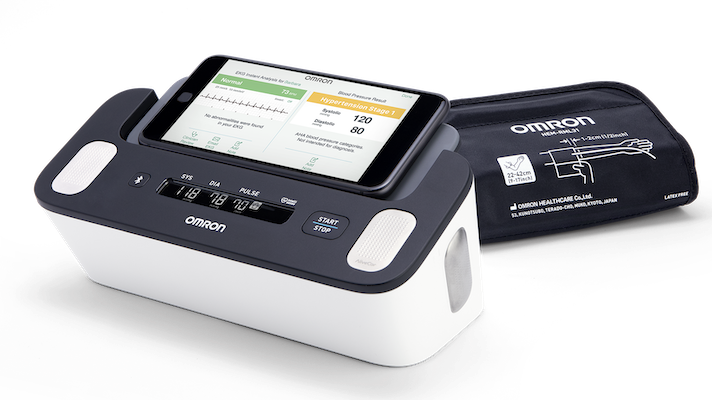 Omron has apparently finally received FDA 510(k) clearance for its Blood Pressure Monitor + EKG device, which was originally announced in January 2018 at CES. The device was created in partnership with AliveCor. This is a separate product from Omron's HeartGuide watch, which also incorporates AliveCor ECG technology and was announced at the same time. "We’re constantly looking at the market to see what’s out there, what technologies are there, and seeing how we can combine our technology with someone [else’s] technology in pursuit of going for zero [deaths from heart disease],” Ranndy Kellogg, president and CEO of Omron Healthcare, said during the original announcement of the device at CES in 2018. “Omron is creating the first blood pressure monitor for use at home that also measures EKG. Up to 6 million people have a-fib. These people are at a five times greater risk of stroke than those without a condition. This is a partnership with AliveCor that’s led to a breakthrough, this home blood pressure monitor with EKG." According to Omron, the product will be available for sale starting May 1, with pre-sale beginning on April 15 at OmronHealthcare.com. AliveCor also just recieved a new, and possibly related, FDA clearance for something called KardiaAI. That clearance could also be related to AliveCor's upcoming Kardia Mobile Gen 2 six-lead device. The company declined to comment. At the American Conference of Cardiologists meeting last week, AliveCor presented a number of different research studies, including one that tested the Gen 2 device at the Mayo Clinic and found it could accurately measure the QT interval, a measure associated with sudden cardiac death. Another study looked at the effect of KardioPro, the company's new remote monitoring platform, on documentation and treatment decision-making when integrated with EPIC. Finally, a recent RCT in the Lancet's EClinical Medicine journal showed that UK doctors using KardiaMobile increased the number of patients with palpitations and pre-syncope in whom an ECG was captured during symptoms over five-fold to more than 55 percent at 90 days.